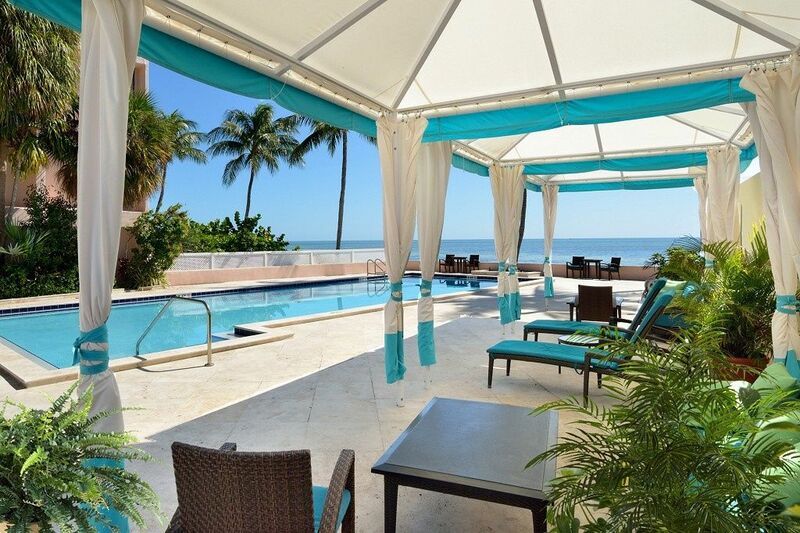 Rare, one-of-a kind designer luxury suite located in an exclusive gated beachfront property. Breath taking views overlook the ocean and natural aquatic bird sanctuary. A spacious ocean front balcony provides the perfect setting for gazing and relaxing. Luxurious amenities include large heated swimming pool and immaculate tennis court overlooking the ocean, plus a second free form swimming pool. Located on the border of the elegant Casa Marina district of Old Town Key West, this "South-Beach" style property is right on the ocean and yet within walking distance to shopping, dining on the beach, charming ocean front park with strolling piers, playground, historic garden club, nature preserve, much more. Right outside the gate a bike path winds along the ocean and leads you to the heart of Old Town. A bike path exclusive location gives you everything Key West has to offer with incredible convenience and style. A South-Beach based architect designed the interior space of this property by setting a dramatic loft-like ladder that leads to spacious second floor. Metal railing creates a long hallway that offers a full birds-eye view of the ocean and pretty beautiful perspective of the living and dining room below. Mahogany pocket doors open to the large second floor bedroom suite with queen size wicker sleigh bed and private bath. Downstairs the spacious open floor plan for the living and dining kitchen area is made to feel extraordinarily grand with roof-high open ceilings and ocean views. This open floor plan creates a spacious feeling and makes it ideal for entertaining the family or a group of friends. At the face of the downstairs hall you will find a luxurious private bath. At the end of the hall is the second bedroom with king bed and private bath. For extra sleeping the living room offers a new queen sleeper sofa. The layout of the bedrooms is ideal for a two couples or a family. This condominium type suite is in on the prestigious 4th floor location. It can be reached by stairs or an elevator. There is designated parking, and space for additional vehicles. The condominium complex is gated and secured with an electronic key entrance. This home is offered as an exclusive vacation rental in the most requested beachfront location in Key West. The property will not tolerate smoking inside. Upstairs — Large bedroom with queen wicker sleigh bed, private bath, and ocean view. Downstairs — Bedroom with king bed, private bath, covered outdoor sitting porch. Living Room — Queen sleeper sofa with new and comfortable mattress. Amenities: Large heated swimming pool and tennis court that overlook the ocean, second free-form pool. Large private balcony overlooking the ocean. Central A/C, washer dryer, parking. Fully equipped kitchen, color cable TV, C/D player, and stereo. Linens and towels provided. Area and Activities: Exclusive beachfront overlooks natural bird sanctuary next to tropical nature preserve. Next to dining on the beach, charming ocean front children's park with strolling piers, playground, historic garden club, nature preserve, much more. We stayed here for a full week and loved it! The waterfront view is unparalleled and the pool / tennis court / outdoor grill area was very well kept. You can easily access anywhere in town via bike. Having the bedrooms on two separate floors made it easy for two adult couples to share the house, though the loft bedroom lacks a bit of privacy (glass door). Regardless, we would definitely stay here again! Loved this rental!!! Great condo, the best location!!! Close to Duval (with cart rental) but a very peaceful place to get away from it all!!! Definitely coming back! Thank you for your comments! It sounds like you found the perfect Key West getaway! We look forward to having you back soon! We loved staying at this beach condo! The only thing we had complications with is getting ahold of someone because we wanted to stay an extra day! First time to Key West and we absolutely loved our stay in this condo. It was perfect it felt like we were the only people that stayed there...we had both pools to ourselves the entire time and no noise from any neighbors. We would recommend this condo to anyone. This is a nice property, very quite and great location. Only issue thy I had with this place was the upstairs bed was a noisy. Rigged while I was there, made them aware of it after checkout. Loved Ft Taylor park. Most beautiful beach and water in Key West. Condo was fine but definitely needed a car...we got a Jeep for the week. Too far from all of the restaurants and ft Taylor to walk all the time.